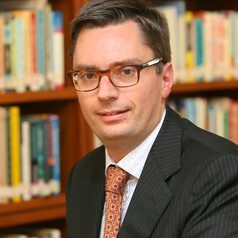 Henrik Cronqvist is Professor of Finance at the University of Miami, where he conducts inter-disciplinary research and teaches finance, entrepreneurship, and management. Professor Cronqvist received a PhD in Finance from the University of Chicago Booth School of Business, and an MS in Business and Economics from the Stockholm School of Economics. Previously, he served as the Zhongkun Group Chair at China Europe International Business School, China’s top-ranked business school. Prior to that, he was the McMahon Family Chair and George R. Roberts Fellow at the Robert Day School of Economics and Finance at Claremont McKenna College. He started his academic career at the Ohio State University, where received the “Pace Setters Outstanding Research Award,” the Fisher College of Business annual research award. He is also a Research Affiliate at the Swedish House of Finance. Professor Cronqvist’s research involves behavioral finance and corporate finance. His work has been published in top-journals in economics, including the American Economic Review and the Journal of Political Economy as well as in finance, including the Journal of Finance, the Journal of Financial Economics, and the Review of Financial Studies. He is often invited to give seminars at academic conferences and to executives and public policy makers around the world. Several of his research papers have been recognized with best paper awards at international conferences, and have been sponsored by competitive research grants. His work has been featured in the Economist, Financial Times, Wall Street Journal, and on CNBC. Professor Cronqvist has extensive teaching experience in the US, China, and Europe related to corporate valuation, entrepreneurship, mergers and acquisitions, and private equity, at the MBA, EMBA, and PhD levels. He has developed many business cases, clinical studies, and simulation models, which illustrate complex financial decisions. He is active in executive education and has managed open and in-company programs in emerging markets, and provides consulting advice to global companies related to corporate finance and managerial decision-making. Professor Cronqvist's current research projects involve understanding behaviors and biases of investors and corporate managers. His teaching projects involve “blended learning” in business education and developing a behavioral finance course.